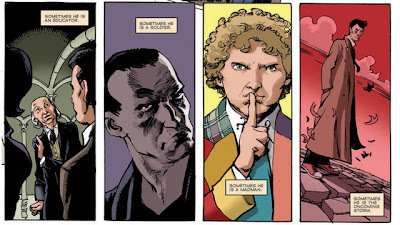 Every culture on every world throughout time and space have their own myths and legends about the Timelords. Many of these stories hold truths, but as often as not the myths do not tell the whole story. The first species to become "time active" (i.e. be able to move through time and understand its workings) were the people of the planet Gallifrey. Those who use the powers of time, and space, are known as Timelords. This optional class for your Swords & Wizardry Whitebox games allow you to bring a bit of science fiction (often using the word science loosely) into your games. Don't expect to play the Doctor or the Master, or even many of the other named Timelords of the Who EU, right out of the box. 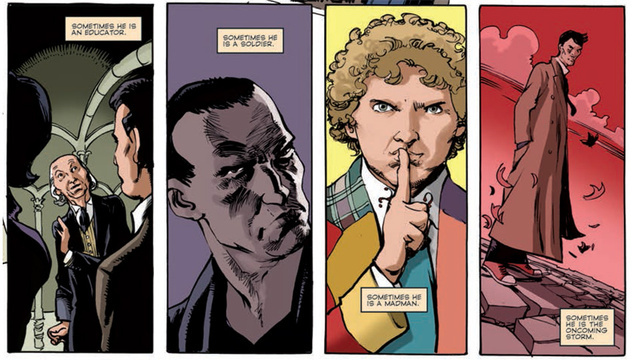 This class assumes someone who has only just recently stolen their own TARDIS, likely inspired by the adventures of the Doctor, and wanted to see the universe as well. If you don't like the idea of a character who can travel through time and space in your games, then take inspiration from the plight of the Third Doctor and strand them on the game world with a TARDIS that has a burned out dematerialization circuit. The TARDIS can be used as a homebase, and occasionally as a source for tools, but never as a way to find weapons. A Timelord has a 1-6 chance of finding a tool or piece of equipment that they need from their TARDIS. Regeneration: When a Timelord is killed (at zero HP or lower) they do not die, instead they regenerate into a new form. They keep the level they were at when they died, but all of the attribute scores are scrambled. All of the scores have to be changed to a different attribute, once scrambled. The Timelord’s XP is reset to the lowest possible for their level. Regeneration take 1-6 rounds, and interfering with the process will cause the Timelord to be rendered unconscious for 1-8 days. Saving Throw: Timelords get a +2 to saving throws versus poison, paralysis, or death. Experience Bonus: The prime attribute for a Timelord is Intelligence. An Intelligence of 15+ grants a bonus of +5% to experience gained. Benchthumping: A Timelord has the ability to fix a device (technological or arcane) by hitting it, hard and fast, with the flat of their palm. This ability has a 1-6 chance of success. At 5th level, this ability increases to 2-6. On the roll of a 6, the device is broken. Scientific Knowledge: The Timelord is a master of science and technology. To this end, they have a percentage chance equal to their level plus their Intelligence bonus multiplied by ten to figure out things of a scientific or technical matter. For example a first level Timelord with an Intelligence of 13 would have a 10% of puzzling out some strange scientific matter, while a second level Timelord with an Intelligence of 15 would have a 30% (2 + 1 = 3 x 10 = 30%) of figuring out the same thing. To the Timelord magic is nothing but an unexplained form of science. TARDIS: All Timelords have access to a type of timeship known as a TARDIS. Those who have gone rogue, i.e. those who have embarked upon a life of adventure, typically have stolen, antique and often malfunctioning ships. In game terms it means that where the Timelord wants to take their TARDIS is rarely under their control, and most often the referee gets to decide where it goes. I was looking for some source files on the Fudge RPG system and, as I usually do when I want to go to the source I checked out Steffan O'Sullivan's (mostly dead and infrequently updated) Fudge Page. While nosing around I found a page that I had never noticed before...a link to something called VG Fudge. It was a very simple variant that SOS came up with for the game, and all that it did was change the Adjective ladder. If you go to the linked page, SOS explains some of his reasoning for making this change...reasoning that I think makes a whole lot of sense. This was posted in 2011 (which shows how long it has been since I looked seriously at Steffan's website). He added a level in between Good and Great (hence the "Very Good" name) and took out Terrible as a level. That may not seem like a lot but to someone who has played and GMed Fudge for a long time...that's a pretty big change. Personally, I think that removing Terrible is a much bigger change to the ladder than adding another "positive" level. taking away Terrible decreases, to me at least, the chances of a truly bad result during task resolution and coupled with the addition of the Very Good level (which I admit isn't the best of names) if really brings Fudge games to a whole new (pardon the pun) level. It adds a bit more granularity to the system, which I think is a welcome change to the game and its rules. I will likely adopt this ladder in my Fudge-based games, although I think that I would probably rename Very Good into something that sounds better. Excellent, maybe? Play with it, and I think that you might find it interesting, too. Once again I find myself falling behind with posting my Dorkland! Roundtables here to my blog. Things have been busy the last couple of week, with the build up to the Swords & Wizardry Appreciation Day, and all that sort of fun stuff, so other things have lagged. Fear not! That doesn't mean that I am ignoring my Dorkland! Roundtables (I do prefer to let them percolate over on G+ and my YouTube channel for a while anyway). I spoke with +Mark Diaz Truman of Magpie Games, creator of such fine games as The Play's The Thing and Last Best Hope. We spent a lot of time talking about the impact of Kickstarter on tabletop RPG publishing, and I think that Mark brought up a lot of good points on how to engage a community before, during and after your Kickstarter to help maximize the appeal of attention grabbingness (yes, I just made up that word) of a game. For better or worse, depending on the project, Kickstarter has changed how role-playing games are taken to market, or sold to people in general. A lot of people are writing today about Swords & Wizardry, and that's a pretty cool thing. You can find an ongoing list of all of the posts over at Erik Tenkar's Tenkar's Tavern (the premier OSR blog nowadays, in the opinion of this non-OSR person). There is a lot of enthusiasm and excitement going on for the game. 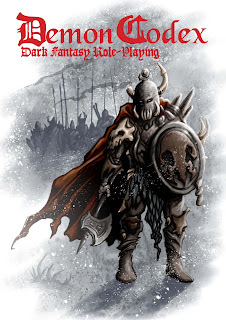 Today only (April 17, 2013) there are also a couple of sale going on (the links to and coupons for I posted last night) from Frog God Games and the Swords & Wizardry SRD site. I would also suggest checking out the Lulu.com storefront of +Matt Finch, the creator/developer of Swords & Wizardry. It's nice to give him some direct support for the cool work that he has done for all of us with this game. If you go the Lulu.com route, be sure to use the 20% off coupon for April: APRILBOOKS13, and get a discount that doesn't cut into Matt's profits. Show some love for this great system that you can get into for free. Also be sure to check out the Google Plus Swords & Wizardry Discussion community on G+. It is unofficial, but Matt and some of the people from Frog God Games all post there, and it is a good place to get questions answered from Matt and from fellow fans. There's also a lot of cool new rules discussion and material posted to the group as well. At the risk of sounding egotistical (I founded the Community...total disclaimer), the Community has really evolved into a premier place for talking about the game online. It has started hooking up community members in games too, which is pretty awesome. Sunday I did a "pre-mortem" post getting a little bit into what got me started down the road of Swords & Wizardry fandom that led, in a way, to today's appreciation happening. 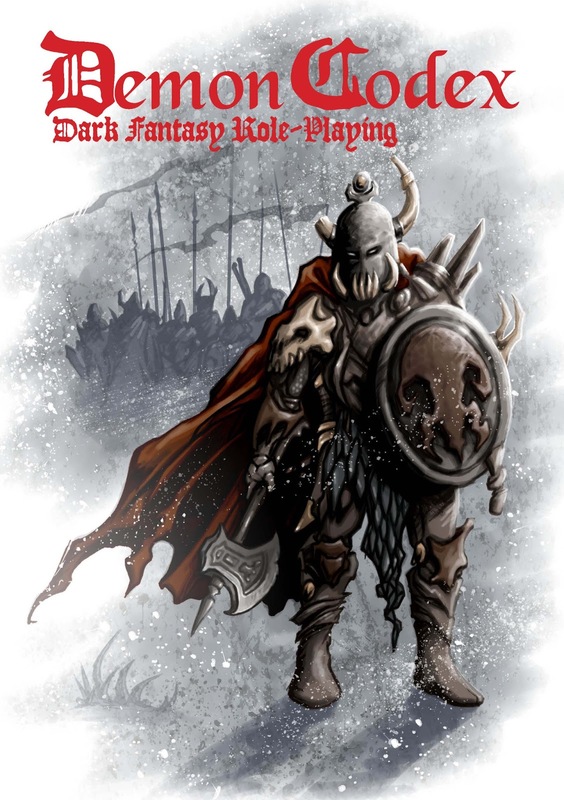 A few months back, a conversation between +Erik Tenkar and myself lead to the first Appreciation Day, that time for the Basic Fantasy RPG (another OSR retroclone). Basic Fantasy nearly became the system that I ended up using for my return to running games and my first ever online gaming experience. Today, I am going to take a slightly different approach for the Appreciation Day than some of the other bloggers. Instead of talking about rules or mechanics, I am going to talk about my first (but not last) Swords & Wizardry game, run via G+ Hangouts on the Air. For the longest time I was incredibly skeptical about running a game online. I just didn't think that it would have the same energy or enjoyment to it. I was so incredibly wrong about all of that. I think that the Google hangouts are a great tool, and for me at least, do a great job of simulating the face to face experience. And considering that our group has a couple of people from California, a Canadian and others scattered around the country...this is a group that never could have happened other than through online play. I have to say that I have made some new friends through this, and developed an appreciation for Swords & Wizardry along the way. One of the great things about playing via Google+ Hangout is that we can record our games. This may or may not be great to everyone, but your mileage will vary. It is nice to have something tangible (as tangible as electrons at least) that you can point to when people ask question like "So, what is this game and how do you play it?" I can give a link and people can experience the awesomeness of the group in action. Above isn't our first session of our campaign (we had been playing for about a month or so by the time that G+ started offering the Hangout on the Air option), but it was our first recording. It took a couple of weeks to convince everyone that we should a) livestream our gaming and b) put it up on YouTube (yes, that's a link to a playlist of all of the videos that we recorded...including a couple of Lamentations of the Flame Princess games as well) for everyone to see in the months and years to come. Obviously, mistakes were made during play. I misruled things a few times, but overall we tried to not let things breakdown and we kept playing through things. 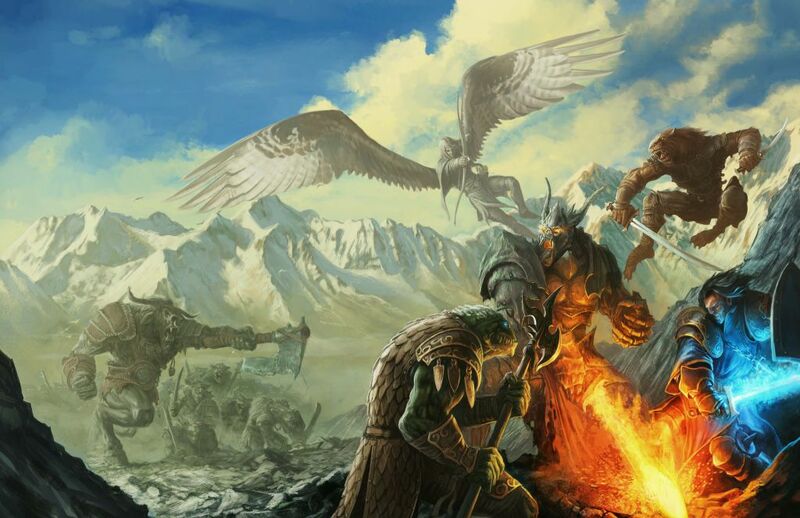 There was a sort of reverse learning curve to the game, as a couple of the players had to unlearn some of the habits that they picked up from years of playing more recent editions of D&D. The acceptance of an old school game wasn't entirely universal, but I think that the dynamics of the group, and the fun that we were having, overcame some of those things eventually. I mentioned to Chris Helton one day the OSR gaming he was talking about sounded fun and he offered to start a game I could play in. That seemed like a lark and that was about a year ago, and the gaming group is still going. I had never played any kind of D&D or tabletop RPG, but I’ve always been a lover of games - board games, video games, word games. But that really didn’t prepare me much for what was ahead. Before the first game, I read over all the rules and tried to make sense of what all the monster tables and lists of spells were for. OK! I was ready… That first night on Google+ I met my fellow gamers and we rolled up our characters. They knew everything; I was completely unprepared. I kept forgetting (and still do sometimes) how saving throws work. They knew all the monster abilities and were blithely arguing with the GM about why they should get a +1 to hit and I was couldn’t really decipher the hit table. In fact, I was having trouble telling a d8 from a d10. Lucky for me, the gamers in our group were some of the most generous, patient and good-natured people you’d ever want to meet. I am still kind of iffy, but after a year of gaming, I’m slightly less of a derp than when I started. Looking back, I can see pros and cons with starting out with Swords and Wizardry. What’s great about it is also what made it hard for me at first. It is rules light, easy to grasp and simple to dive right in. Being rules light also means, though, that you have to be inventive, bring some background knowledge to the game, and not rely on the book to resolve every question. But having just read what I wrote, maybe that was a positive even for a first-timer. All the discussions about how things could or would work, the stupid mistakes that wound up working out in spite of myself, all the laughing and poking at each other we all did… A lot of that would have been lost if we had been following a more prescriptive system. And that wouldn’t have been nearly as much fun. So, right from the trenches we see that Swords & Wizardry can be used to make someone with no experience with tabletop RPGs into a gamer. I honestly think that Ethel sells herself a little short, after 30+ of gaming I still have brain farts about what to do and not to do at times (I think our game play videos have plenty of evidence to show that), and she took to gaming like a fish to water. Yeah, there were some hiccups. Gaming, for better or for worse, does have a lot of jargon to it that a new person has to learn and over come, but like she said, I think that the group really came together and tried to help her out and smooth over some of the rough patches. Ethel has even run a few sessions of her first adventure (which you can catch near the end of the playlist of our videos). It only took a short while before she was in there, making Monty Python jokes and acting all gamer-like with the rest of us. The thing that affected our play as a group most was the streamlined nature of the rules. There was a lot of room to improvise creatively and use items and the environment in creative ways to increase our effectiveness far beyond our collective hit dice. In Chris' campaign we found ourselves seriously outclassed on a a few occasions but managed to avoid the TPKs with some out-side-of-the-box tactical play that was not covered by the rules. Instead of covering everything the rules left room for creative solutions. David was also the person who helped mentor Ethel's new gamer. He helped with explanations and patiently explaining things multiple times (if needed) in order to help her out. Plus he also embraced some of my weird approaches to fantasy game worlds, and I think that helped things a lot. David really helped to push my campaign in new directions, when I thought that I was going too far already, by taking some of my weird plot ideas, and weird dungeon crawling ideas, and running with them. My time with S&W has shown me that you don't need a complex set of rules to have complex setting and characters. If anything, the non-intrusive rules have allowed such areas to deepen. Also, the hallways are very cozy. +Jeremy Whalen who, sadly, no longer games with us, provides a bit of a counter point towards the game. Showing how things can vary within a group. Jeremy provided the muscle to our early adventures, with his Fighter Goreaxe. I really enjoyed my role and the system was certainly quick and easy but I think it may have been a bit too streamlined. One specific incident sticks out in my mind. Early in our campaign we were exploring a dungeon, hot on the trail of the mysterious chaos that threatened the region, when we burst through a door and confronted a pack of lizard men (if I recall correctly). Goreaxe rushed forward and attacked, as intent to kill his enemy as on protecting his party. The initial flurry went well enough but when it came time for our opponents to attack they simply did an end run around Goraxe to hit the soft wizard left behind in the doorway. I objected and sought to interpose Goreaxe in someway but apparently they were too quick for him as. I felt quite impotent as the wizard took the beating that should have been for Goreaxe. Mechanically S&W just didn't’ work that way and it left me, as a player, somewhat frustrated by the oversight. Now to be clear I do not advocate for systems that attempt to codify every eventuality as that is simply not practical. What should have happened? Well I think it came down to narrative and presentation. When I objected Chris simply indicated the rules did not support that and then proceeded to keep the game moving however I was disappointed, and for a few moments, my happiness index fell. Honestly, it seems like we mostly came to very similar conclusions about the game and its approaches, and found that it was a style that suited us as a group, once we were all able to get into the mindset and allow ourselves to stretch our muscles. 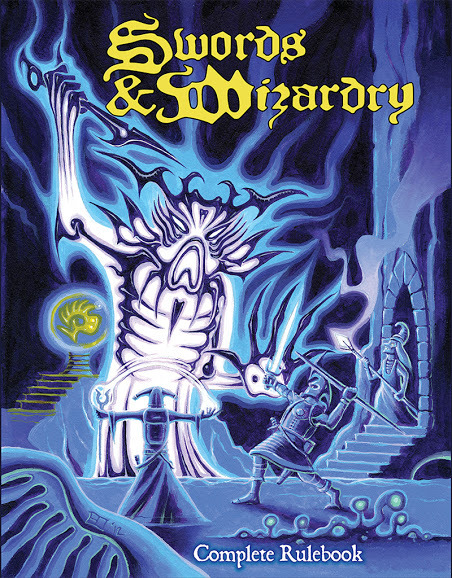 Swords & Wizardry supplied us with a light and flexible ruleset that supported us when we needed it, and also got out of the way when we needed that. I honestly don't think that our game would have been the same, or as much fun for any of us, if we had used a different game. Swords & Wizardry has officially become my go-to fantasy game, and I don't see that changing any time soon. As a GM, and as a game designer (both hats were worn in our previous campaign), Swords & Wizardry provides a solid, but light, foundation that encourages me to hack it and do with it as I want. That was demonstrated in some of my different approaches to a traditional dungeon crawl, and interaction with the characters and the world. Our next game is going to be based on S&W as well, but we are going back to the Whitebox rules as our foundation. I'm also using the encouragement of the players to hack things a bit more extensively than we previously did. I am adding a skill system to the game (adapted from a Basic Fantasy RPG hack), doing away with the Cleric as a class, and adding other little mechanical bits and pieces. Ironically, during the time that we have been playing this game I discovered and fell in love with the world of the Warhammer Fantasy Role-Playing Game and have started tracking down some of the early edition material for it. While I like Swords & Wizardry as my system, I am finding that a non-D&D type of setting suits me, and my fantasy interests better. In our next campaign, Demon Codex, I am going to embrace a lot of that and turn this game into my game, and then by extension into our game. It has been a fun road. Not only has Swords & Wizardry introduced my friend to the wonderful world of gaming, but it has also allowed me to meet some great new people and game with them. It has also let me find a community of people interested in this game, and their different approaches have shown me new and different ways of looking at the game. It has also allowed me to meet and pick the brain of Matt Finch (who will be appearing on a future Dorkland! Roundtable). It also led, indirectly I guess, to so many bloggers talking about a great game on this day. Thank you, everyone, for contributing to a great community and for helping to make such a great day. Click on the image to see it in all of its glory and thanks to Sean for providing this special preview. 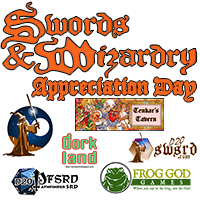 Unless you've been hiding under a rock for the past few weeks, you know that tomorrow (April 17th, 2013) is Swords & Wizardry Appreciation Day. 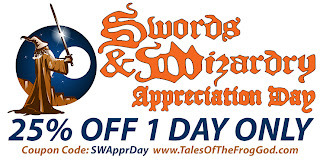 There's going to be a couple of sales, and I wanted to make sure that you have the coupons ready so that you can buy up all of the stuff that you really need for your Swords & Wizardry games. These coupons are good for twenty-four hours only (I assume that they will likely kick in after midnight EST because, well, I am on EST but do not take that as Gospel). There are two sales that will be going on. 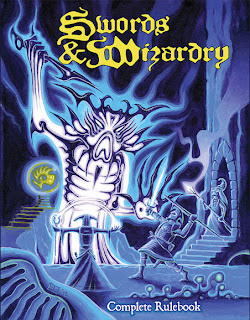 First, is the eStore of the Swords & Wizardry SRD site: http://shop.d20pfsrd.com/collections/swords-wizardry-appreciation-day There you will find a list of Swords & Wizardry products in PDF form (some even by third party publishers). Their sale is only for the items on that page, but the coupon code (SWAD252013) will get you a 25% discount on the 17th. Frog God Games is also running a sale on all Swords & Wizardry products bought directly from their website (unlike the SRD store, this sale covers print and PDF products). The coupon code for the FGG's site is SWApprDay. The FGG sale does not include subscriptions, pre-orders or items $1 or less. Remember: These coupons are good only on April 17, 2013. Tomorrow will be a big day. There is going to be a lot of talk about Swords & Wizardry out there in the gaming blogosphere. It is going to be fun. Guardians of Order's Mark MacKinnon Resurfaces...On Kickstarter! I regret to announce that Guardians of Order, the Canadian games company that issued the GAME OF THRONES role-playing game last fall, is closing its doors and going out of business. Although the GoO website remains open and there is some fan activity on the message boards there, it would appear that orders are no longer being fulfilled and emails to Guardians itself are going unaswered. The company's office has been vacated, and the company phone has been disconnected, When I finally reached GoO's owner and president Mark MacKinnon last week, he confirmed what many had come to suspect -- that he is shutting down operations. MacKinnon is presently attempting to place some of GoO's games with other companies. Interestingly, at the time, the speculation was that Mongoose would end up with Guardians properties (a little known fact is that Mongoose white knighted the publication Guardians last few books before White Wolf stepped in to help with the Game of Thrones and BESM 3e games). We all know now that White Wolf ended up owning the properties. First, an apology. I am terribly sorry that George Martin broke the news about our situation. That is certainly not how I wanted the information to be released, and I had thought that my frank conversation with him about A Game of Thrones-specific issues was in confidence. This is the second time now that someone other than me releases very important news about Guardians Of Order, which leaves me frantically trying to patch the holes. The polite and proper thing for me -- as President of the company -- to do would be to contact all of our creditors (which includes some great freelancers and industry associates) FIRST and explain the situation to them. I was working on that process when my efforts were derailed by one simple website post. So I am very sorry that someone else took it upon himself to release this information. It's not how I was proceeding to handle things. The archive is also non-existent but (with forethought) I also copy/pasted MacKinnon's post onto a blog post. I also did an extended blogpost that archived a timeline of the blowup and meltdown. Updated:Thanks to +Eric Franklin I have a link to the Guardians LiveJournal (which has some interesting things to show). We probably shouldn't be surprised if this suddenly disappears. It also came to light a year or so ago (over in a thread on RPGNet) that MacKinnon had not only failed to pay freelancers for a number of the final http://guardiansorder.livejournal.com/ products, and had stiffed publishers in the company's Magnum Opus program, but he had also kept PDFs up on the OneBookshelf site that he no longer had the rights to sell. Unfortunately I do not have a link and the RPGNet site is notoriously hard to search. If someone can find a link to this, plese let me know in the comments here, or over on G+, and I will put the link up in this post. Updated: I found the thread wherein it was discovered that MacKinnon had been selling the PDFs (including licensed anime properties that he no longer held the license). Now, MacKinnon has resurfaced, with a project for a board game called Upon A Fable over on Kickstarter. He even uses shots of games that freelancers never received payment for in the video on the project page. Some have called for funds raised from the Kickstarter be used to to pay back those who were never paid. I doubt there's any legal recourse, since Guardians is long gone and I am sure that they held the debt rather than MacKinnon directly, and I'm not going to assert moral recourse in this case. My reasoning for posting all of this is so that people can be informed and, hopefully, not throw good money down a deep, dark hole. This is someone who has already demonstrated a willingness to take money from a number of sources, not pay the people who have done the work and ignore communications before disappearing. This game marks my first published design in over seven years ... and I made a critical mistake. I assumed that a professional Kickstarter campaign presentation, combined with attractive graphic design and engaging game mechanics, would be sufficient to reach my Kickstarter funding target. How wrong I was. Within the first 48 hours of the campaign, I knew the funding attempt would fail; shortly thereafter, I made the decision to cancel the campaign. With our reworked pledge plans we are also in the position to lower our funding goal to $25,000 from $30,000. Although our costs to proceed with the project will exceed $30,000 -- printing high-quality board games is expensive! -- we are backing Upon a Fable with some of our own money as well since we will selling additional copies through retail store channels as well. Any profit to be made will be on those back-end sales and not just by meeting our minimum Kickstarter funding goal. We want to give Upon a Fable the best chance to succeed, which is why we settled on the $25,000 target. Undercharging for a project is never a good sign that the people will be able to deliver on the project. They are already in a hole on funds, and should something unexpected happen...they will be even further in the hole. The email gave this link, but when I followed it I couldn't find the exact passage. I may just be blind. Updated: I am blind. It turns out that the above quoted bit came from an April 11th update to the Dyskami Publishing Facebook page. Hopefully people will read all of this, follow the links and read a bit of the history before deciding to put their money on something like this. The Swords & Wizardry Appreciation Day is coming on April 17th. For me, this is a day that has been months in the making. Last summer an online friend decided that she wanted to give tabletop role-playing a try. Unfortunately, she was in California (still is, actually) and I am down here in Florida. That would require a really big tabletop. Then G+ started up their Hangouts, a way to do browser-based video chats that was tied in to your Google account. It was good. I was surprised, honestly. I had avoided online play for a long time because I had believed that it wouldn't be the same sort of experience as face to face gaming. It turns out that I was wrong (which isn't something that I announce very often) and the gaming was a lot of fun. I think that luck had a lot to do with it, finding the right mix of people that worked well together. I've never really considered myself a part of the OSR, or any old school movement. When I decided that I wanted to run this game online I started looking around for a system to use. Free was the first consideration. This was a game for someone who might not actually even like it. I didn't want her to go out and spend a bunch of money on a game, or hobby, that it might turn out that she wouldn't like. Simplicity was the next consideration. I am, at heart, a pretty rules light kind of guy these days, and games with a lot of crunch really aren't really my thing anymore. Even with those two considerations, that still leaves a lot of games as contenders. Eventually I narrowed it down, and I ended up settling on Swords & Wizardry as the game to use. I liked the clearer explanation of the rules from the original (and better organization). I had hoped that it would make it easier on someone who had never gamed before to be able to get into the rules. We start with Whitebox, because of all of the available versions of the game, this was the simplest of them. It seemed a good starting point. The game clicked for all of us, and the mechanics were mostly easy enough to understand for her as well. She had a few difficulties understanding some of the finer points that those of us in the group who were more experienced with gaming had come to grips with long ago, but some further explanations (and none of us being afraid to look stupid helped a lot) smoothed things out eventually. However, one of the things that seemed to help her out the most was when I reccomended that she read Matt Finch's (that's the creator of Swords & Wizardry) Quick Primer to Old School Gaming. I don't agree with all of it, and I certainly never played all of the ways that are talked about in it, but it is definitely a great resource for understanding this style of play, and it helped her to better understand a lot of the things that already made sense to the rest of us. Over time everyone fell into their characters and the idiosyncrasies of my style of GMing, and we all had a lot of fun. Battle were fought. Scars were earned. Narrow escapes were made. Along the way we even playtested a few things, and my friend wrote her first adventure and tried her hand at GMing herself. Really, not so bad for about seven months of gaming. As I said at the beginning of this post, Swords & Wizardry Appreciation Day is coming, and there are going to be a lot of bloggers talking about the game around the internet. It is very cool and I am glad to be a part of it. This is just another step the journey of gaming that I've taken over the years, only now I have at least one more friend who is walking on that trail as well. I've also made some cool new friends and gamed with them. I've also discovered an awesome game in Swords & Wizardry and I see myself getting a hell of a lot of mileage out of it over the rest of my life.